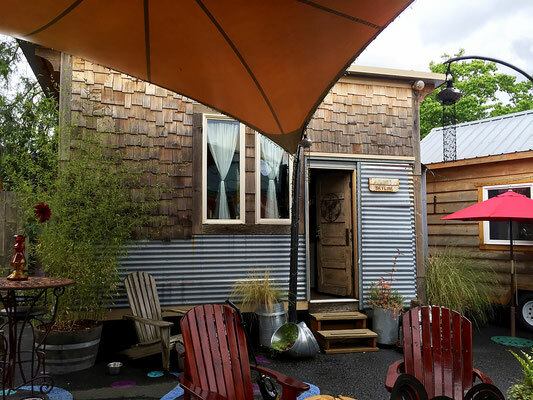 Welcome to your insider look at a completely one-of-a-kind hotel in the lovely quirky and artistic town of Portland, Oregon! This article brought to you by Caravan who provided complimentary access. Affiliate links included. See disclosure for more. 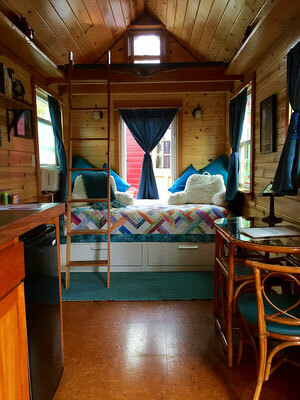 Caravan is an extremely unique hotel that is entirely made up of tiny houses on wheels which travelers can rent out by the night and get to experience the feeling of living inside a real tiny house. 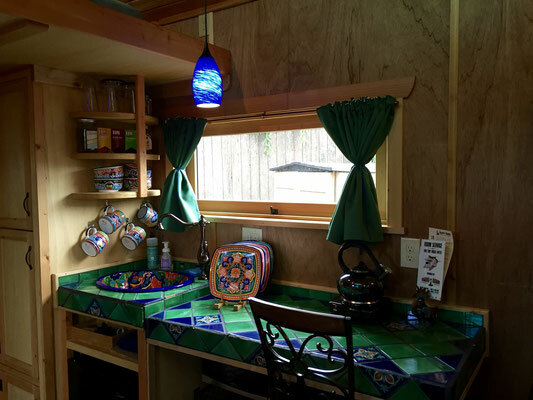 Tiny living started as a movement of people voluntarily choosing to downsize and simplify their living space, to skip the traditional life of excess stuff and excessive bills, and to live more purposeful, greener, and minimalist. 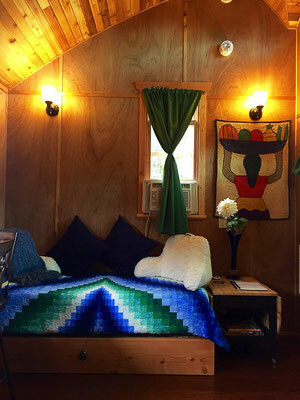 Tiny houses can be as unique as the builders that make them, but they generally fall within about 100 to 400 square feet, hence making them officially 'tiny'. 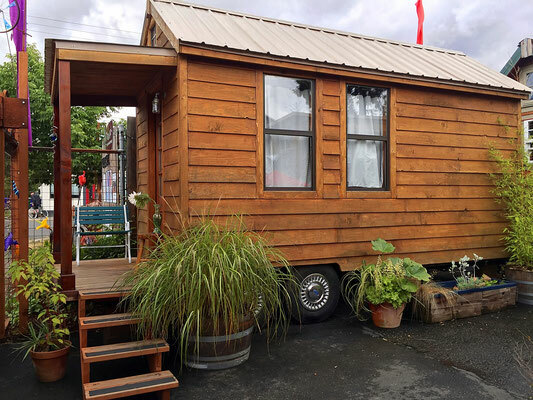 Tiny homes can be totally off-grid, rustic and out in the middle of nowhere. Conversely, they can be super luxurious, with all the mod cons that can fit inside. The imagination is the limit. 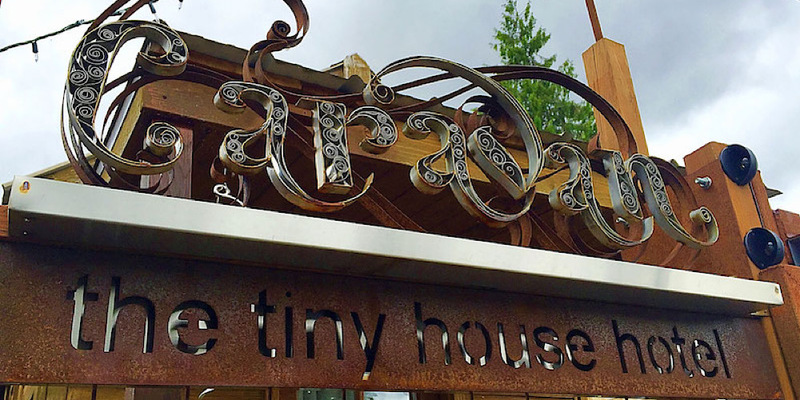 Now let's take a tiny tour of the tiny houses at Caravan: the tiny house hotel! And, this is a fully functioning hotel, so yes, all of the houses on the property have heat, running water, showers, and flush toilets. There's no roughing it here. 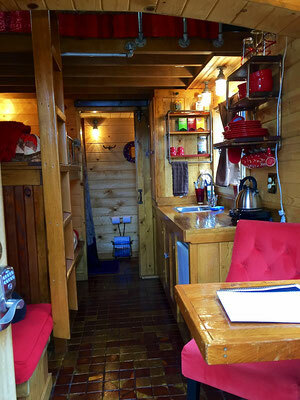 In fact, they are some of the nicest tiny homes I've ever seen! Each one is uniquely themed and adorned with thoughtful artistic touches. 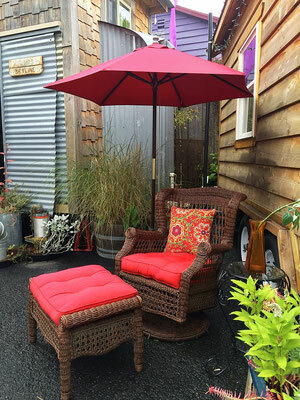 Caravan even has an inviting central courtyard adorned with rustic tables and chairs for guests to gather and relax at. They hold community events like live music nights and roast s'mores over the central fire pit! 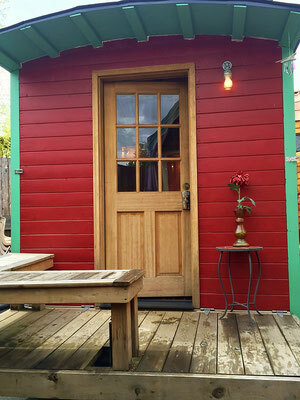 The first tiny house is the Rosebud. It's the one that started it all. 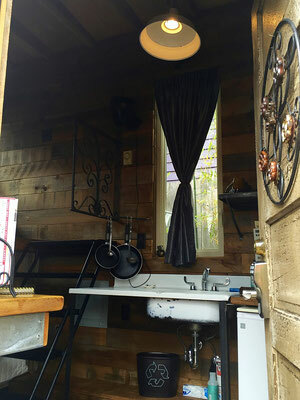 Traditionally designed, at 120 square feet, it has a bed upstairs, a cushioned bench downstairs and pullout table. It also features some cool touches like river rock countertops and mason jar lights. Next up - the Tandem. It measures in at 160 square feet. 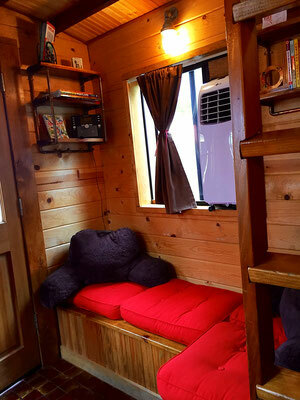 It has a bed upstairs and and a trundle bed downstairs that doubles as a seating area. Soft, warm wood tones give this house a rustic cabin-ey feel and it's adorned by Portland and bicycle themed artwork. 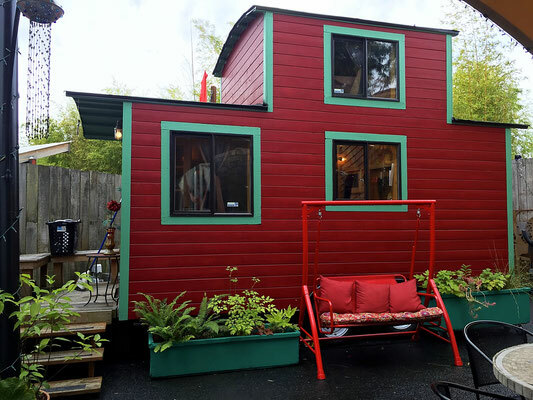 The Caboose, the red little beauty, is named and designed after a train caboose, of course. 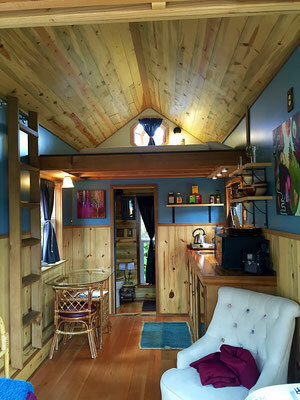 It's curved roof, copper shelves, and wood floor add to the cozy and rustic charm of the 134 square foot house. 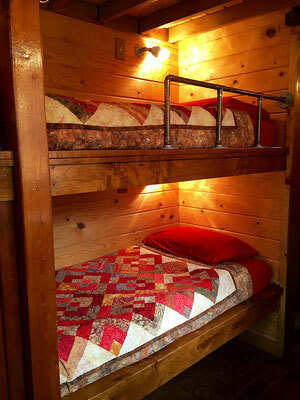 It has a queen bed tucked away in its upstairs loft and underneath, two bunk beds. I love all the matching bright red touches in this one. 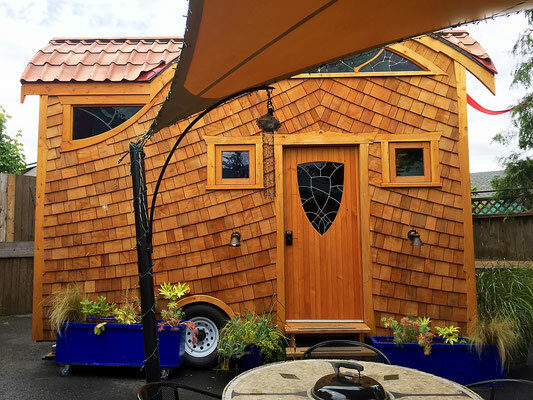 A very unique tiny home, the Pacifica, has a side entrance, and is covered in beachy cedar shingles. 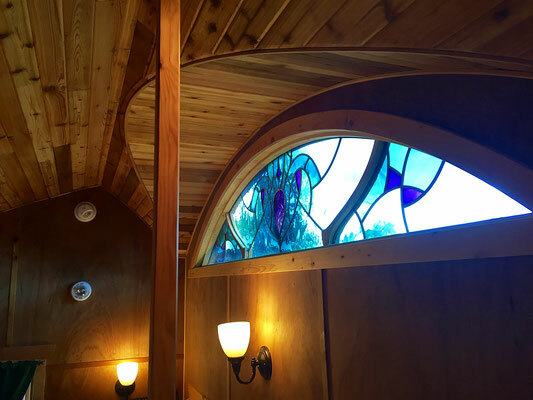 It's design and beautiful stained glass windows mimic ocean waves and the pairing is complimented with lovely greens and blues of the fabrics and Talavera tile. 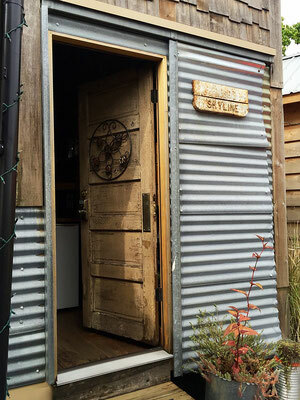 My favorite, the Skyline, is built almost entirely from reclaimed and salvaged materials. 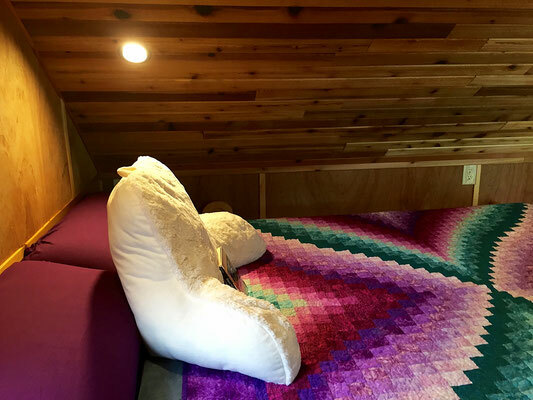 It measures 142 square feet, has a ground floor queen bed and traditional yet industrial staircase with a queen bed in a loft. I love the beautiful simplistic look and muted colors. 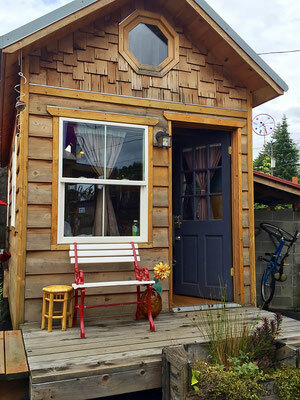 Lastly is the Kangablue, another tiny house traditional design measuring 170 square feet. 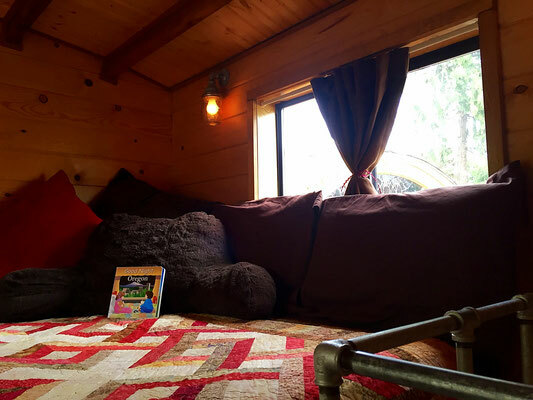 It has a sofa bed and the loft boasts a memory foam queen mattress. It's super roomy, with a calming color scheme and even has a ultra chic chair to relax in to boot. 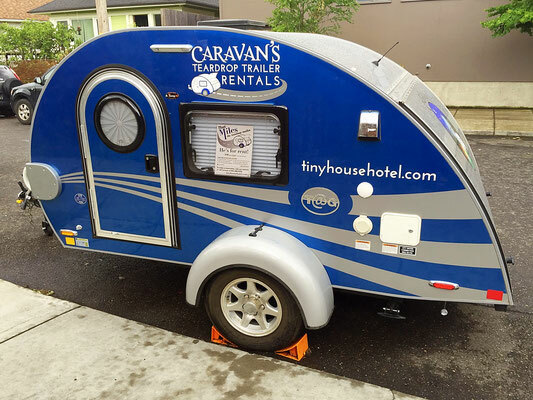 Caravan also rents 3 tiny teardrop trailers so you can take your tiny experience on the road. 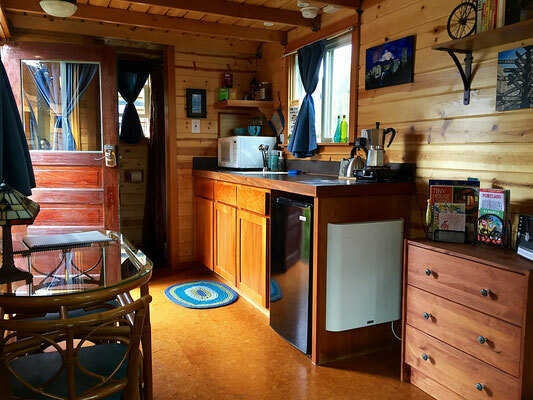 Rosie, Miles, and Sunny all come equipped with beds, tvs, kitchens, refrigerators, stoves, heat and AC! Miles and Sunny also have microwaves and moon roofs! 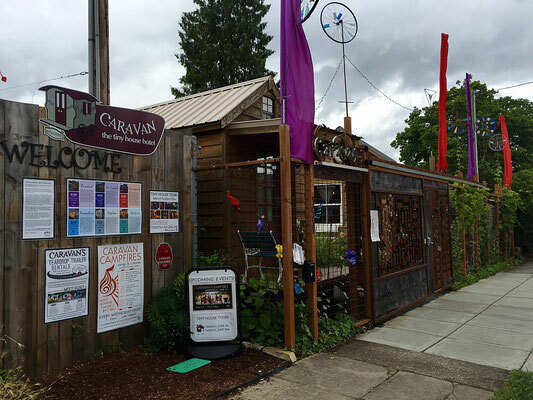 Caravan is quite unique as a tiny house hotel and has received tons of attention from the tiny house community as well as Portland fans! Peep this hilarious clip from Portlandia! 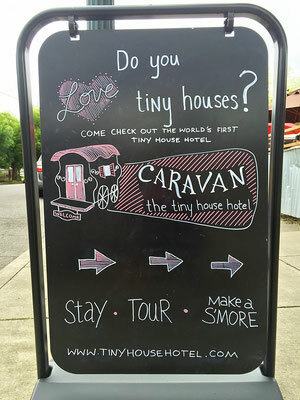 Check out more details about the Caravan community and all the tiny houses at Caravan, The Tiny House Hotel! If you're in Portland, stop by the hotel, located in the ultra hip Alberta Arts District, at 5009 NE 11th Avenue. 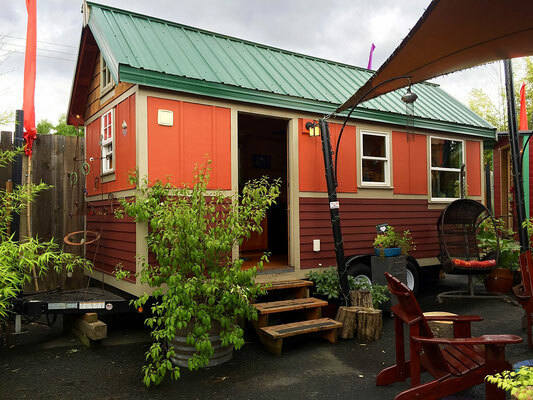 Word to the wise - the tiny houses book up months in advance so reserve yours soon for your next visit to Portland!